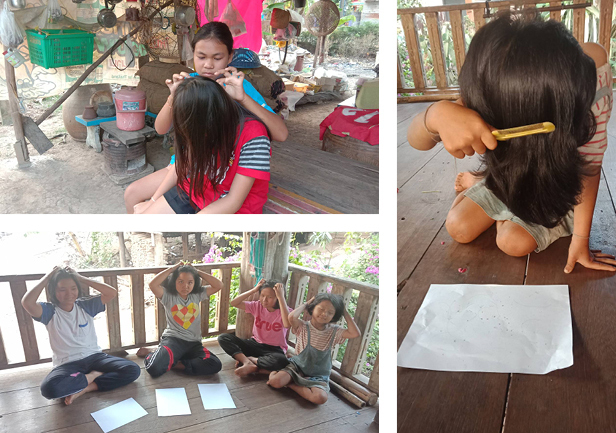 Goal: Pearl S. Buck Foundation (Thailand), Phitsanulok and Mae Ramard Branch Office realizes the importance of getting rid of head lice. Head lice is a disease that can be cured easily by teaching the girls and their families and caregivers how lice are spread, how to get rid of them, and how to keep them from coming back. This project will teach them how to use natural herbs and local knowledge to prevent the spread of head lice, how to use medicine to treat head lice, and provide knowledge for head lice prevention. Organize meetings with school teachers and parents to make plans and set up core-working team. Coordinate with related healthcare staff and volunteers to prepare medicine to get rid of head lice per local knowledge, and demonstrate how to make the medicine. Provide knowledge and advice to children and parents/caregivers in household about not sharing towels and combs, how to wash bedding, etc. Organize training to teach the head lice life cycle, controlling head lice, providing knowledge to children and their caregivers in getting rid of head lice to children, and organizing activities to get rid of head lice for children (2 times/month). Organize promotion campaign in communities on head lice awareness, provide follow-up healthcare visits at children’s houses to encourage parents/caregivers to observe and participate in the community effort to eradicate head lice. Provide hair-cut service to schools and community and provide a mobile lice prevention education unit.